I do all my photo printing at home and hinted earlier that my favorite paper is a store generic. Yes, it’s the truth! You can catch up on why I print at home in this post. I only buy 8.5×11″ photo paper. I can never get 4×6″ sheets of paper to work for me. Plus, I rarely print just 4×6″ photos, but when I do I can lay them out on an 8.5×11″ sheet and cut them out. Printing on larger sheets lets me do cool things like photo blocks like I did in this layout or tiny photos as in this layout. What if I need to print a picture now but can’t fill up an entire 8.5×11″ sheet? I save the rest of the sheet for later so there’s no waste. Satin. Not gloss, not matte. As far as I know, Staples is the only manufacturer that offers satin paper. I don’t like the glare of glossy paper and it’s too easy to fingerprint. Matte photo paper pretty much looks like a sheet of cardstock. No fingerprints: this is great when I’m cutting out the pictures and handling them while scrapbooking. I don’t have to be that careful with them. Dries fast: I can start using these photos 20 minutes after I print them (and that’s with me waiting to be on the safe side). Heft: the paper has a nice heavy feel to it and the pictures don’t look like they were cheaply produced. Satin sheen: the photos have a matte finish with a nice sheen to them. It’s kind of like glossy taken down a notch. I can’t find this in my local Staples and have to order it online. I really hope they don’t discontinue it because it’s a fantastic product! Note: I was not paid by Staples to endorse this item just as I am not paid to endorse anything. I only feature items that I love and actually use. This entry was posted in Photography, Scrapbooking, Supplies, Thoughts on Scrapbooking and tagged photo paper, photo printer, print at home, scrapbook, scrapbooking, staples by Nat. Bookmark the permalink. Ditto ditto ditto. That’s pretty much everything that happened to me when I picked paper. I’ve tried other generics, including other Staples generics and they were awful. I used to buy Kodak Matte but then they switched their matte to essentially be cardstock. I knew I didn’t want gloss and really had to think about my choice. I decided to go with the Staples Satin and have never looked back! They sold it in the store that first time I bought it and I think I was able to take a sheet out of the package and feel it. 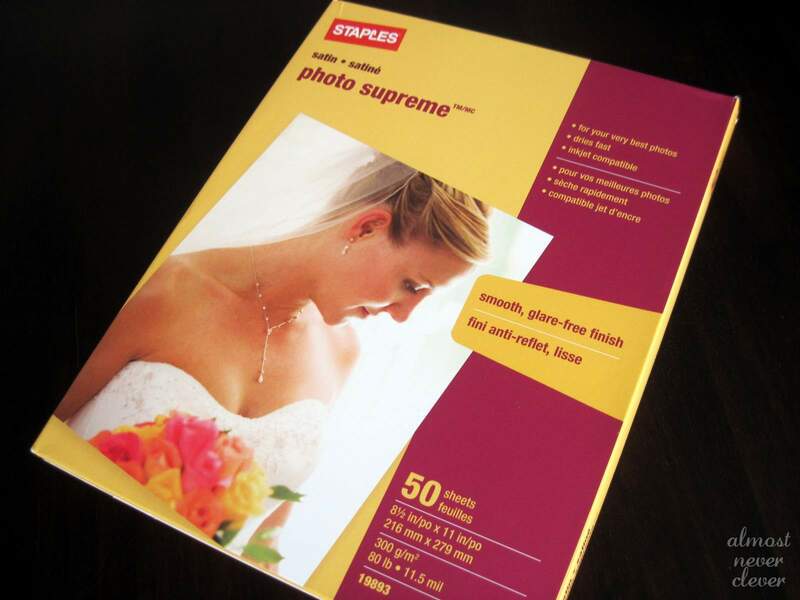 Staples Photo Supreme Matte has been my go-to for years for everything; mostly card making. I purchased Epson brand on a BOGO deal, and am in process of returning as it is not nearly the quality of the Staples brand. I would like to try the Staples Supreme SATIN for those projects that would do well with a slight gloss. But one reviewer posted that the back side of the paper does not take a ballpoint pen well (for cards). Do you have experience with this? Also is it printable on both sides? I’ve never tried writing on the back so can’t say for certain! It is only printable on one side.